Propane is one of the most commonly used heating and energy sources in the world. It’s used for everything from grilling to providing heat to powering appliances on the go. For RVers, propane allows them to do everything from cook to clean to heat water and more. Let’s look at RV propane basics so you can use this energy source efficiently and safely on your next trip in our latest RVing 101 class. Propane is a form of liquid petroleum. It’s used as a gas. It’s essential for most RVers who hit the road if they want to cook. Many RVers don’t know the full extent that propane can be used when vacationing. In fact, some starting out with RVing don’t realize they can use propane at all. Propane is used by RVers because it’s cheaper than gas, it’s available just about everywhere you travel, and it’s a green fuel solution especially when traveling. 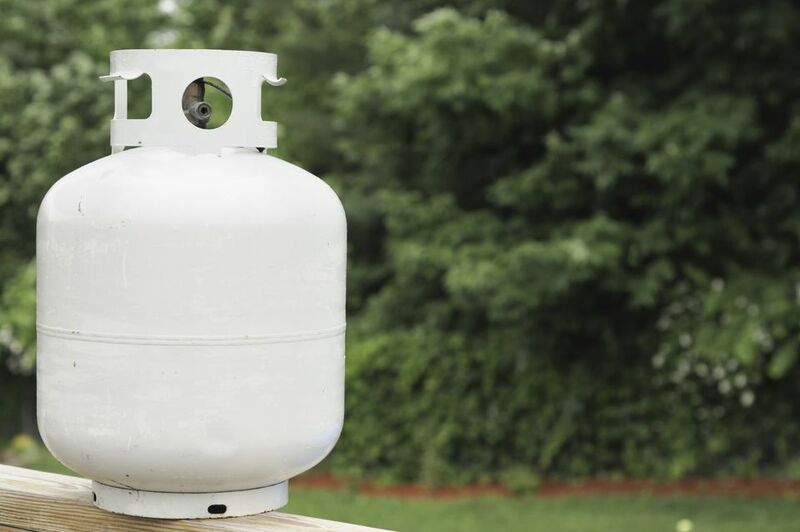 There’s no shortage of propane on travels, and you can often pick it up at gas stations, home improvement stores, and RV parks during your travels. If you choose to dry camp or boondock at destinations, using propane is a straightforward way to cook meals, take a shower, or stay warms for brief periods of time. There are two ways any RVer can use propane: They can convert a generator to use propane, or they can use an RV hook up specifically for propane. Most RVs and trailers on the market today provide propane hook up. If yours is one that doesn’t, mostly older models, you can use a generator converted to use propane to take advantage of its energy source. Empty propane canisters can be swapped out for new ones, allowing you a quick way to replace them on a trip. Many campgrounds and RV parks offer a place to swap out empty propane, and if not, it’s usually a short trip to find a place in the area that does. Once hooked up, propane can be used to grill outdoors, cook indoors, heat your RV, cool it, and keep you comfortable during a trip. Some RVs use a combination or propane and electric to run appliances. If you have RV hookups available, use propane sparingly. If you’re running on propane, make sure you swap out tanks accordingly during your trip. Pro Tip: Never, ever use propane when driving. Your propane canisters should be secured on the outside of your RV or trailer and never indoors when in motion. Invest in a proper storage solution for safety during your travels. Two of the most common issues with propane are leaks and regulator failures. The regulator controls the pressure of propane coming from the tank to appliances. Most regulators last eight to ten years. Once it fails, it must be replaced as there’s no way to repair it despite what you might read on the internet. You can smell propane when it leaks, and most RVs and trailers come with detectors that help alert you to any issues with propane leaks. Make sure to test your carbon monoxide and smoke detectors before each trip, along with your propane detector to ensure you and your family are protected. If you smell propane, do not under any circumstances turn on appliances in your RV or trailer. If you don’t smell propane but want to ensure you have no leak, run some soapy water on your propane connections. If bubbles begin to form, you have a leak; if there are no bubbles, your connection is okay to use. Pro Tip: Any time you suspect a severe propane leak you cannot locate, you should evacuate your RV or trailer and call the authorities. Do not try to find the leak, open windows or do anything that could cause a spark or static that could ignite the propane.